US helicopter gunships have been firing at targets in a Shia Muslim district of Baghdad on the second day of a revolt across Iraq by a religious militia. Supporters of radical cleric Moqtada Sadr have been involved in violent protests against the US-led coalition. The coalition accuses Mr Sadr of trying to usurp its power and says the revolt will not be tolerated. US troops also began an offensive in Falluja, a Sunni town where four Americans were killed and mutilated. The protests were triggered by the closure of Mr Sadr's main newspaper a week ago; they intensified after the arrest on Saturday of one of his top aides, Mustafa Yacoubi. Many of Iraq's majority Shia Muslims, repressed under Saddam Hussein, welcomed last year's US-led invasion, and attacks on coalition forces were largely confined to the minority Sunni community before Sunday's violence. However, Mr Sadr has become an increasingly outspoken opponent of the occupation. The US administrator in Iraq, Paul Bremer, said on Monday that Mr Sadr's followers had effectively placed themselves outside the law. 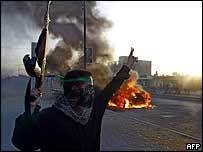 Apache gunships targeted militiamen of Mr Sadr's Mehdi Army on the streets of the capital's mainly Shia district of al-Shuala as a battle raged on the ground, correspondents report. One US vehicle was reported to be in flames, but there were no immediate reports of casualties. 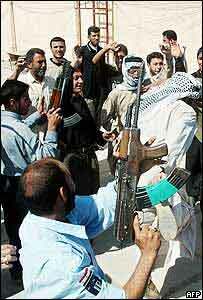 At least nine coalition soldiers and 46 Iraqis have been killed in confrontations related to the protests. The likely outcome will be the same as Yugoslavia after Tito went. Poisoned chalice, anyone? Local resident Abbas Amid told the AFP news agency that fighting had flared after a US troop convoy tried to enter Shuala and came under heavy fire. There was also tension in Sadr City, a district which saw eight US troops and a reported 22 Iraqis killed in Sunday's fighting. American tanks were blocking approaches to the area and soldiers were carrying out vehicle searches as angry protesters gathered again. In Basra, about 150 Mehdi Army members occupied the governor's office at dawn on Monday as part of the protests, but said they were staging a peaceful sit-in. Brief exchanges of gunfire have been reported outside the office with soldiers from the city's UK garrison, but there is no indication of casualties. Four Shia Iraqis were killed in clashes with UK forces in the south-eastern city of Amara on Sunday, while a protest which turned violent near the holy city of Najaf left a coalition soldier from El Salvador dead, along with about 20 Iraqis. Coalition forces arrested Mustafa Yacoubi in connection with the murder last year of a rival cleric, Abdel-Majid al-Khoei, and closed down the Al-Hawza newspaper on the grounds that it was inciting violence. Paul Bremer accused Mr Sadr of seeking to "establish his authority in the place of the legitimate authority". "We have a group under Moqtada al-Sadr that has basically placed itself outside the legal authorities, the coalition and Iraqi officials..." he said in Baghdad. Grand Ayatollah Ali al-Sistani, Iraq's leading Shia cleric, appealed for calm and negotiations on Sunday, as a call to "terrorise the enemy" circulated among Moqtada al-Sadr's followers. "There are now fears that a new front in Iraq's conflict is opening up"